Most politicians are smart enough to stick their snouts in the trough when no one is looking. EPA head Scott Pruitt is one of the dumb ones. His pea-sized brain would rattle in his skull if it wasn't cushioned by an enormous ego, one that causes him to think he's a famous and important person who needs to be protected from all the little people out to get him. Hence the first class and chartered flights, the luxury hotels, the soundproof offices, and the 24/7 security detail. It's gross overreach for a man whose only job is to hand over the department he runs to companies that want the freedom to eject pollutants into the air and water. I barely had time to get over being squicked out by the news that Pruitt ordered a staffer to procure for him a used mattress from one of Trump's hotels, when I learned that Pruitt used his expensive security detail to drive him to different hotels in a desperate search for a certain kind of special moisturizer he is fond of and is available at Ritz-Carltons. I'll bet the manufacturer of the lotion is terrified over being outed. Sales would tank. It might even spell the death of the company. 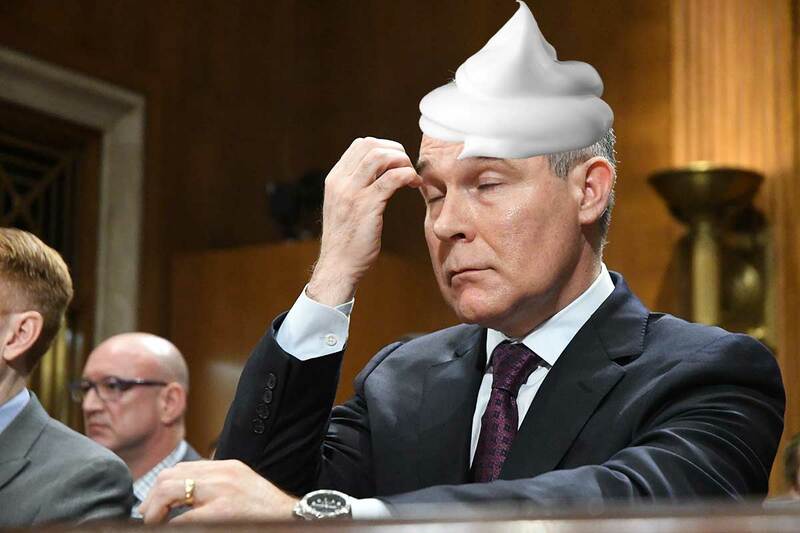 The Daily Beast reported on Thursday that Pruitt has also tasked subordinates during work hours with getting snacks for him, including Greek yogurt and cookies, citing four sources familiar with the work environment at EPA. One individual told the Daily Beast, "I can't tell you how many times I was sent out to get protein bars" at Pruitt's request. An EPA spokesperson told the Daily Beast, "EPA will not be commenting on anonymous sources who are working to distract Americans from Administrator Pruitt's accomplishments on regulatory certainty and environmental stewardship." Pruitt is currently facing multiple inquiries from ethics watchdogs, federal auditors and congressional committees into his actions at the agency. The inquiries are looking into Pruitt's travel expenses as well as his security detail. Figures released by EPA last month showed that the agency spent close to $3.5 million on security costs for Pruitt in the past year. That money has gone toward paying a team of 19 agents who offer around-the-clock protection for the administrator. Ah, so this is were we are now: Trump’s campaign manager can finally let his psychopath flag fly without fear of universal and permanent censure.